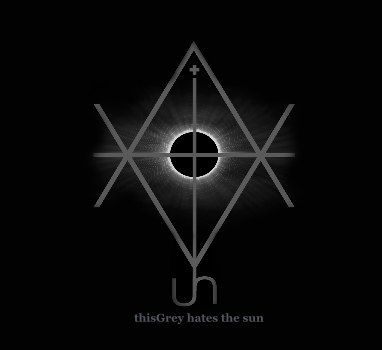 The first full length album by thisGrey Hates The Sun is a sonic journey wandering between noise and ambient where the author manages influences from various field of experimental music into an almost coherent view. This album is based upon two long track, the first and the last, and short tracks which explore elements from them so Giordano Rivolta, the mind behind the project, even if he uses mostly synth and guitar he doesn't rely on a single formula but achieves a reasonable level of variety. The minimal pulse of "In" introduces the listener into a sonic framework where the author proceeds by accumulation creating a soundscape able to deflect the attention from the foreground to the background. "201.2b" is a short assault for samples and feedback. After the first part of "Broken", based on a noisy guitar, the track has an interlude based on silence and samples to return on the territories of the first part. "No Good Situation" is a minimal track based on drones and sinewaves while "From" use the same structure using noises. "The End Of The Labyrinth" is an apparently simple track based on sparse synth notes generating the sense of being played in a distant place. "Trying To Metabolize A Tragedy" is a slowly evolving track whose sonic nuances require attention. "There Is A Message Here" oscillates between quiet moments and noisier ones. "Austen" is an introduction to "Moments & Directions" whose guitar drones, with an heavy reverb,hypnotize the listener awakened by the solemn notes of "With Other Eyes". An uneasy listening, even if it moves along almost familiar path, as some of the musical content is not rooted on sound but on how it sounds and so it requires a proper listening habit and a clear mind. It's really worth a bunch of listening until all details are discovered.